This page will guide you to extend size of system partition on Windows Server 2003, 2008, 2012, etc by using partition software. 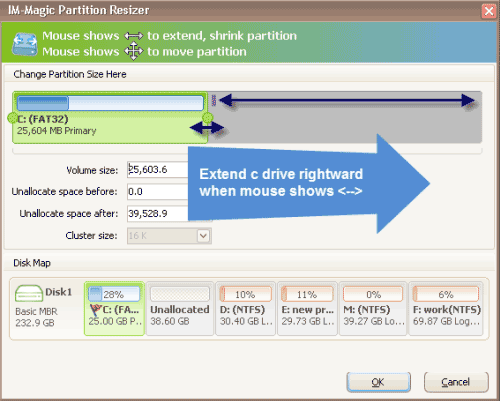 Download IM-Magic Partition Resizer Server to increase size of system partition on Windows Server when there is low disk space. System partition is running out of disk space on Windows Server 2003, 2008, 2012? Do you want to extend size of system partition when it runs onlow disk space ? Usually your system partition size has been limited after your installing the OS once you have set a limitation on it. If there were just 120GB volume space on the system partition, then it would be pretty tough to run smoothly after serveral years of installing new programs or running a database on your OS. So, the choice of fixing the low disk space problem on c drive is to get it expanded. How to expand it without formatting disk or reinstalling the OS? Shrink some space from large volume. Click "Apply" button to get the system size expanded on your OS. 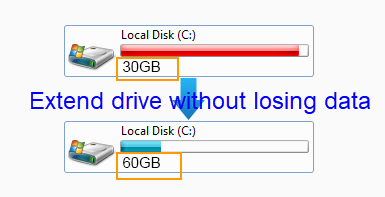 "There is only little available space left on system partition on my computer, so I am trying to expand the size of this partition. My computer is running under Windows Server 2008 operating system. The Extend Volume option under Disk Management is greyed out, so I cannot extend the system partition there. Is there any other way to increase size of system partition on Windows Server 2008?" IM-Magic Partition Resizer Server is able to extend system partition whether it is FAT32 or NTFS partition without rebooting your PC. It is 100% safe with time roll back technology that ensures the safety of your server OS if there were unexpected accidents occurred. This partition software also supports RAID 5 array to help resize disk partition when there is no enough free space. 1. You can run Diskpart command to extend a partition on Windows Server, but Diskpart can only extend data volume which has NTFS file system. In the other words, if you want to extend system partition or FAT32 partition, Diskpart command will fail to extend the partition. 2. You can run Disk Management on Windows Server 2008 to perform partition resizing, but the adjacent unallocated space is always needed in order to get the partition extended. When you are unable to extend system partition by relying on Diskpart command or Disk Management, the best solution is to use IM-Magic Partition Resizer Server.